Can it overcome the region's problems? 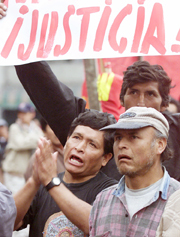 Latin America has made great advances toward democracy over the past decade. Mostcountries are now accustomed to relatively free elections and peaceful transitions of power. But poverty rates and economic inequities remain high in many countries. And even though political violence has subsided in the region, crime rates are high. Some democratic governments are too weak to deal effectively with civil-disorder issues, and many are rife with corruption. Critics say that Peru and Venezuela illustrate the continuing threat to democracy from authoritarian or stridently populist leaders. But Mexico's election of a new president from the opposition party provides a hopeful sign for democratization in the United States' closest Latin American neighbor.